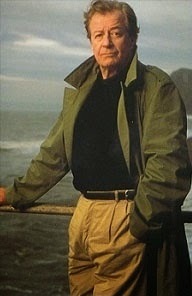 James Clavell (1921-1994) was born Charles Edmund Dumaresq Clavell. Clavell was born in Australia, the son of a British Navy officer. In 1940, Clavell joined the Royal Artillery and fought in the Pacific theatre of World War Two. He was captured by Japanese forces in Malaysia, and taken to Changi prison in Singapore where he was held for over three years. The Changi POW camp was notorious for its inhumane treatment of prisoners. Of the 150,000 people interred, only 10,000 survived. He left military service in 1946 and attended the University of Birmingham for two years. He married April Stride in 1951, with whom he had two children. In 1953, Clavell moved to the United States (he became a naturalized citizen in 1963). In the U.S., Clavell began a career in screenwriting. He wrote the screenplay for the sci-fi classic The Fly (1958), co-wrote The Great Escape (1963) and wrote and directed the Sidney Poitier film To Sir, with Love (1967). During a screenwriters strike, Clavell began working on his first novel, King Rat, a fictionalized version of his experiences in Changi. The novel was published in 1962. This was the first of what would later be named the Asian Saga, a series of six books that make up the majority of Clavell's oeuvre. The second book in the series, Tai-Pan (1966) placed eighth on that year's annual bestseller list. The third, Shogun (1975), placed ninth. Noble House is the only one to take the top spot. The fifth, Whirlwind (1986), placed third and the last, Gai-Jin (1993) did not appear on the list at all. Clavell passed away in 1994 due to complications from cancer while in Switzerland. Excluding a prologue, Noble House takes place over the course of ten days, from August 18th, 1963 through August 27th. The main plot of the novel is the ongoing battle between the two major trading companies in Hong Kong, Struan's, now led by the novel's protagonist, Ian Dunross, and their rival Rothwell-Gornt, led by Quillian Gornt. Both sides play dirty, complex games as they try to outdo each other and at the same time win the alliance of Par-Con industries, and American company looking to become international. While all this is going on, easily over a dozen subplots occur, covering everything from opium smuggling, romantic troubles, and Soviet conspiracies. 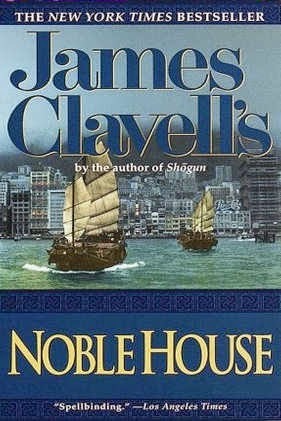 In Noble House, Clavell tries to capture the economic free-for-all of Hong Kong in the 1960s, as well as to explain the psyche of its residents. The depiction of Hong Kong natives and their ideology is interesting. It would be easy to just write it off a stereotypical, but at the same time it may be an accurate representation of the view an outsider would have in Hong Kong society, a society with a very different set of cultural norms than ours. Politically, the novel is very focused on economics, and takes a 'red under every bed' approach. In the context of the beginning of the 1980s, and the economic policies of Reagan and Thatcher, this may reflect the views of Western audiences of the time. Ian Dunross is the individualist hero who succeeds in business by virtue of his own cunning and bravery which, within the context of the novel, I think it may be a little disingenuous, considering how often he is saved by luck or circumstances beyond his control. As a business thriller, for lack of a better term, Noble House is an engrossing but slow read. Clavell has a habit of delivering important information in an offhand manner, often as one sentence in the middle of a long paragraph, that can easily be missed if you tend to skim. Shogun remains the most famous and best-reviewed of the Asian Saga (it had a TV miniseries/movie in 1980 and one currently in pre-production). King Rat and Tai-Pan were given film adaptations in 1965 and 1986 respectively. 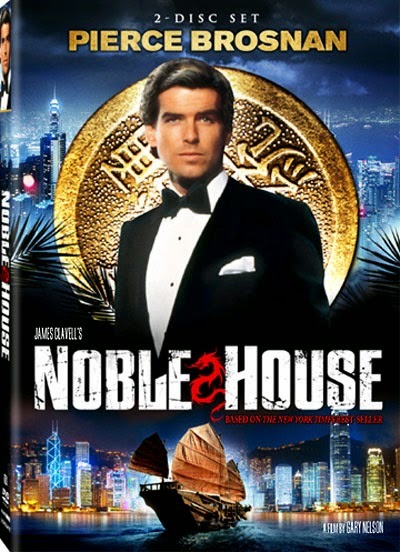 In 1988, Noble House was adapted as a four part miniseries starring Pierce Brosnan. Noble House is a mixture of business, espionage, and legal thrillers, with a lot of subplots. The genealogy of the characters would be more at home as a Lord of the Rings appendix. But if you like your entertainment thick and complex, Noble House is for you. Clavell, James. Noble House. 1981. New York: Dell, 1981. Print.